I am all about new fantasy books and was ready to gobble up this book from Tor which will release in April. An incredible display of variety in world building. Maia is the youngest and exiled son of the Emperor. When the Emperor and his other sons are killed in an airship accident, Maia is thrust into the spotlight. Lonely and totally unprepared, Maia will win your heart. This book blew me away. For a story that takes place 90 percent of the time in the same setting, it changed and moved and never felt dull. Most of the story is told from the royal court which seemed to be a mix of Czarist Russia and ancient China. I was astonished by the scope of detail in the world, so many characters with such complex and similar names, yet I was never confused. A master hand created and deftly weaved this mix; it is Tolkien with an Eastern flavor. For a story with few big action scenes, it captured and held my attention with effortless ease. Much of the plot was of course based on political maneuvering, but the innocence and humility of Maia put me on the edge of my seat to see if he would sway the harsh court to his side. It's been a long time since I felt such affection for a main character! 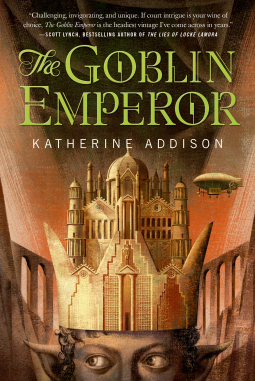 I highly recommend The Goblin Emperor. I received an advanced copy of this book from Net Galley in exchange for a review. Sounds good. I'm going to add it to my "to-read" list.